Summer = Girls and Swimsuits - Alter's Kos-Mos Swimwear ver. It's summer in my corner of the world and when I think of summer two things come to mind, the beach and girls in swimsuits. Sadly for me, there is no beach near me and I don't have a cute female companion to take with me. I will settle for the next best thing, my favorite fictional girl in a swimsuit, Kos-Mos. I have to mention that this is my favorite figure in my collection even though it's been almost a year and half since I acquired her. This 1/6th swimsuit version of Kos-Mos was released last year in January for hefty price, at least at the time to me, of 8,800 yen. This particular figure introduced to me to a facet of figure collecting, delays. She was originally scheduled for release in the late summer of 2008. I'm an avid fan of Kos-Mos, she was the first fictional girl to really get my adoration way back in 2003 when I played Xenosaga Episdoe I on the PS2. I happily played through the trilogy of games, with the last one being released in 2006. However, I did not get into figure collecting until summer of 2008 meaning I missed on several figure releases of Kos-Mos. That's why when this version went up for pre-order I didn't miss a beat and she went to become my first pre-ordered figure and at the time the most expensive one as well. This is an Alter release and it lives up to the expectations one expects from them. The sculpture and painting are spot on, nothing much to say about it. One thing I love about this figure is the nice curve Kos-Mos body follows in this pose. The face sculpture is accurate with what Kos-Mos looks like in the games and other media. One detail I loved is the eyes have that camera lens look fitting well with Kos-Mos being an android. A complaint I have about the face is that due to the length of the hair bangs it's mostly obscured unless looked at from a little bellow her face level. 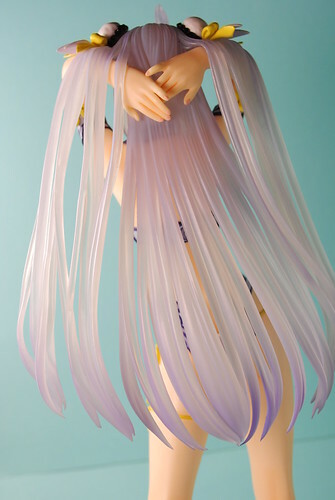 Much like Alter's first Kos-Mos release her hair is a translucent soft blue and in this case made of soft PVC allowing some degree of movement for it. I have to mention that in a couple spots, a hair strand in the back and in the ahoge, the paint has chipped leaving a colorless mark on the hair. Kos-Mos came with only two accessories, a couple of knifes, one that with a an anklet that can be attached to her leg and another stand alone knife. I actually have no idea where the second should go but it fits nicely in her hands. I didn't mention it earlier but Kos-Mos is sporting her swimsuit from Xenosaga Episode 3 which is one of the several alternate costumes you can get her in the game. The details on the swimsuit are pretty nice, so is the design following an Asian motif. As you can probably agree with me when looking at these pictures Kos-Mos wears it quite well with her body having the right curves for the swimsuit. I love this figure, like I said before my favorite in my collection. I see no reason why to pass this one, even less for a Kos-Mos or Xenosaga fan. I took a bunch of more of pictures you can find them all in the flickr set.